I am still waiting for their reply for SMO possibility. Fin-less clean design looks pleasing but not practical for high powered flashlights. Well, it is these reasons I do not buy the MT03. The UT03 on the other hand is beautiful. Somehow my interest never gets noted… add me to the list pls! I was not recommending a fin-less design. It is up to Haikelite to find the right combination of looks to performance that ultimately leads to higher sale numbers. Just to be clear, the MT03 does not have to look beautiful to sale, it just needs to look acceptable/decent. The MT01, MT02, SC01 and SC02 all look nice. The MT07S is pretty similar to the MT03, but it looks a lot nicer in my opinion. Notice the transition in the middle of the head, it has a nice 45° angle to it rather than a 90° step. It has all the fins in place. The fins are a little shorter in certain areas. The button looks very nice. The tail cap has several flats on it which look nicer than the round MT03 tail cap. I think you get my point. It’s the little tweaks and refinements that can make a big difference. I don’t know Haikelites history. Maybe the MT03 was one of their earlier designs and the MT07S is a newer design? The MT07S is much improved cosmetically in my opinion. Anyway, if Haikelite is reading these forums maybe they will consider a few changes to the MT03 to make it look nicer. Maybe come out with a MT03S or MT03 III? Am I the only one here that thinks the looks could be improved or do you think it looks nice right now? update my one for white colour with a smooth reflector and a cool white tint colour please? SMO reflector is not guaranteed at this stage. HaikeLite did mention that MT03 should have a floody profile. Interested in a NW version! What is the difference between the first version and this one? 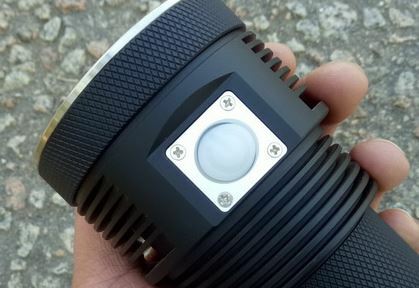 CREE XHP 70.2 (Generation II) upgrade. Area around the power button will be darken for black version. Definitely good looking lights. I mean very good looking lights. It would be interesting to see a review to find out how the new XHP70.2 perform, in terms of output, throw and tint of CW and NW. I think this would help sales for Haikelite as well. Switching to the 70.2 should not have any effect on the output or throw since this light uses a constant current driver. If it used to FET driver, then output would be greatly increased. So you think the appearance and shape of the lights looks very good? Personally I think MT03 is a really great design; definitely one of the best in my opinion. I also just love the look of a bunch of decent cooling fins, which happen to be practical as well. Perhaps the tailcap can be a bit thicker, as the light now appears to be sort of tapered: huge top, and relatively narrow bottom. Honestly I think I should get this light sooner or later; I’m just hooked on flood lights. I wish the UT03 project was active. 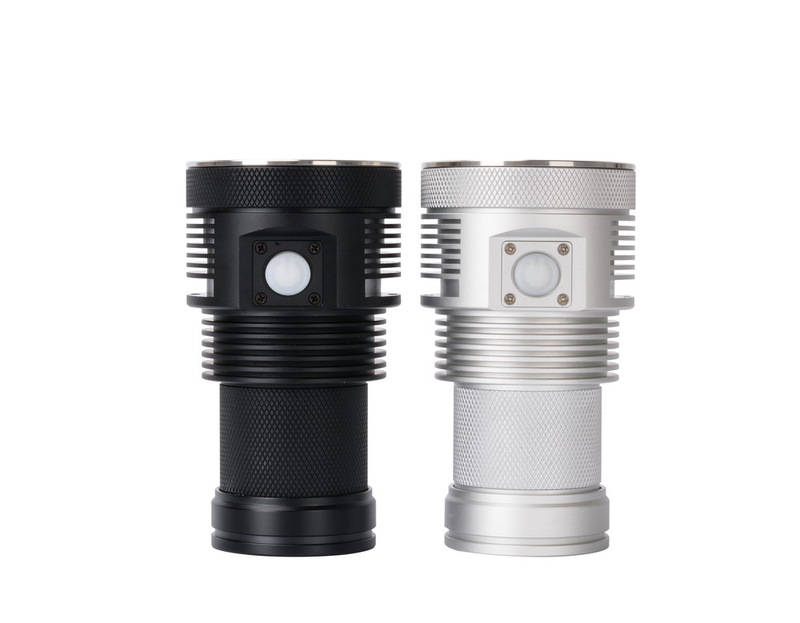 I like its ergonomics better, but I already have a MT07, and want to see about getting a matching MT03 to mod into a serious lumen monster like TomE did. In if 70.2 and in NW. Is this instead of the Utorch UT03? Kinda makes it redundant doesn’t it? You basically have two different companies fighting for your hard-earned dollars. This is good, because the competition keeps the prices low. Unfortunately the UT03 is on hold right now, so it may come out later on or it may be canceled. Nobody knows. Comrades what do you mean CW /NW? Which temperature in Kelvin? But 3500-5000 it is huge difference. Freeme, can you send me the price? I think I know what they sell for, but want to make sure. My opinion is that the consensus here states neutral white is 5000K. Occasionally some neutral white lights are 4500K, but the majority of neutral white lights are 5000K. HM..I have many “NW” lights.All of them have temperature 3300-4400.So I interested in Haikelite opinion. I always think WW But 3500-5000 it is huge difference. I have a Convoy C8 with 4C tint bin, which is so far my ‘reference’ neutral white, being 4300-4500. I also have a Convoy L6 with 5C tint bin, which is on border with warm white. For me, HaikeLite’s neutral white is on border with cool white (I have an MT03 with that option, also ordered a few more SC02 and MT01 a few weeks before). This is why I could welcome anything warmer (if they could make it available), than their 5000 NW option.